Home / NCAA Soccer / NCAA: BC, UConn & Dartmouth Advance to 2nd Rd. A trio of New England’s soccer powers emerged victorious in the first round of the Division 1 Men’s College Cup tournament, which took place across the country on Thursday. Boston College beat Vermont 1-0 in Chestnut Hill thanks to a Simon Enstrom goal in the 71st minute. The Eagles will face 14th-seeded South Florida in the second round on Sunday at 1pm. 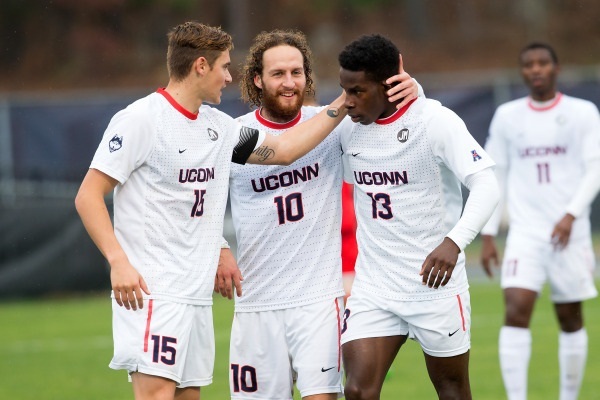 UConn staked a decisive 3-1 victory over Boston University in Storrs, with the Huskies’ goals coming from Deandrae Brown (54th minute), Kwame Awuah (76th minute), Kwame Awuah (83rd minute). Felix De Bona scored the lone strike for the Terriers. The Huskies will meet 16th-seeded Indiana on Sunday at 12pm. Last, but not least, it took extra time for Dartmouth book its ticket to the second round after Alexander Marsch struck in the 105th minute to give the Big Green a 1-0 win over Hartwick in Hanover. Dartmouth will face sixth-seed Syracuse on Sunday at 2pm. The winners of Sunday’s matches will return to the pitch during weekend of Nov. 28/29 for third round action.